Colorful, full and lush, this extraordinary casket spray makes a memorable and touching statement of sympathy that’s sure to be a comfort to grieving family and friends. 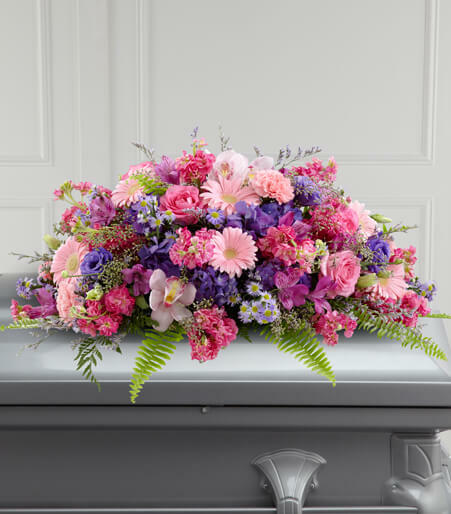 This vibrant mixed flower casket spray is a generously scaled floral creation of bright and blue spring color, designed and constructed by a local artisan florist and includes pink carnations, cymbidium orchids and gerbera daisies, hot pink roses and stock, purple hydrangea and lisianthus, lavender alstroemeria, Monte Casino and limonium all accented with lush greens. It’s made to fit over the closed portion of a casket cover during visitation at a funeral home, at a funeral service and at a graveside ceremony at the cemetery. Product is not appropriate to send to a residence.